Life Member – This member classification consists of those members who have served a minimum of ten (10) years as a lobbyist in Georgia. The Board of Directors is empowered to grant members access in this classification on a reduced or no annual membership fee basis. The proposed member must have been a member of GPLA during the ten consecutive years of service and must be fully retired from the profession of lobbying or not receiving compensation for lobbying services. This membership category has no voting rights and is not eligible to serve on the Board of Directors. Associate Member – This member class would consist of those individuals, partnerships or corporations, LLC’s etc. who have a special interest in GPLA members or in the profession of lobbying. Policies governing this membership category shall be determined by the Board of Directors. This membership category has no voting rights and is not eligible to serve on the Board of Directors. 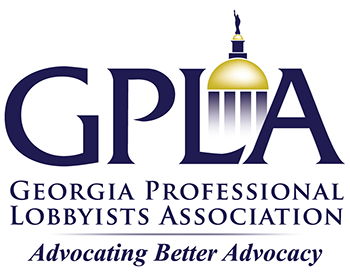 Affiliate Member – This member class was established for administrative assistants of registered lobbyists who visit the Capitol occasionally and who would benefit from GPLA notices regarding disclosure deadlines and other compliance matters. A photo and contact information for the Affiliate Member will be included in the GPLA Pictorial Directory. Retired Member – This member class will create an opportunity for inactive lobbyists to continue to receive GPLA e-News and other notices. A photo and contact information will also be included in the GPLA Pictorial Directory for as long as the retired member wishes to be included. Agree to complete the initial education course developed by the Association in a timely manner as determined by the Board and subsequently satisfy the continuing educational requirements established by the Board. Confirm that they are a registered lobbyist in this state. Agree to participate in the dispute resolution process prescribed below and to waive any cause of action on the part of any other member arising from that member’s good faith participation in any disciplinary matter that substantially complies with the process. To review the GPLA Bylaws, click here. © Copyright 2018 ART5. All rights reserved.